Olivier Kirsh is Maître de Conférence (Lecturer /Associate Professor) at the Université Paris Diderot / USPC / Université de Paris. He’s teaching biostatistics, molecular biology, functional genomic and bio-informatics from L2 to M2 at Univertsité de PARIS (Paris – Diderot, Paris 7). He’s regulary invited in panels (Magistere de Génétique, Master BI, Ecole Doctorale Compléxité du Vivant, Thèse, Comité de sélection de Maître de Conférence…). He’s also teaching for « formation continue » at the Cancéropole, L'école de bioinformatique AVIESAN de Roscoff and for the DU « Bioinformatique intégrative ». 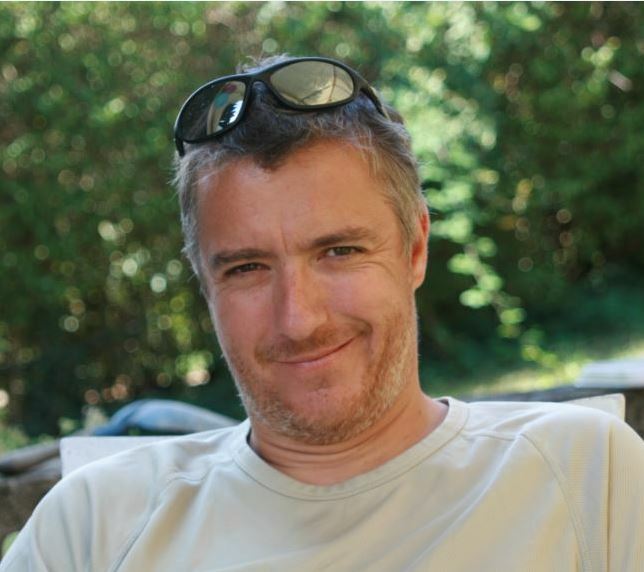 In september 2013, Olivier joined Pierre-Antoine Defossez’s team to deploy bio-informatics and bio-analyses approaches (eg : Nanostring, ChIP-seq, RNA-seq, microarray, Whole Genome and Reduced Representation of Bisulfite Sequencing (WGBS & RRBS analyses) to study the interplay between kinases signaling pathways, chromatin remodelers and DNA methylation for the control of gene expression in cancer cell and during mouse embryonic stem cells differentiation. He’s a member of our Bioinformatic platform. He develops pipelines and scripts used to explore and analyse experiments implementing high-throughput sequencing technologies. His daily tools are R, Bash or Docker to run computational analyses on our cluster. Olivier also mentors masters and PhD students in "classical" molecular biology approaches. He did his PhD at the Institut PASTEUR in Dr Anne Dejean’s lab (Unité d’Organisation Nucléaire et Oncogenèse) working on SUMO, a new Ubiquitin-like post-translational modification and senescence. He did a postdoctoral training at the Institut de Recherches Cliniques de Montréal (IRCM) in the laboratory of molecular genetics of Dr Jacques Drouin where he worked on the molecular mechanisms of nuclear receptors transcriptional repression. Then he moved to the Institut de Génétique Moléculaire de Montpellier (IGMM) in Dr Claude Sardet’s lab where he developed bio-informatics and high-throughput sequencing technologies approaches to characterized the E4F1 transcription factor target genes. His contribution enlightens unexpected functions linking cell cycle, genome integrity and metabolism for this transcription factor in cancer and post mitotics cells. He also worked with Dr Eric Julien on the H4K20me1 epigenetic mark involved in replication origins licensing. Naciri I, Laisné M, Ferry L, Bourmaud M, Gupta N, Dicarlo S, Huna A, Martin L, Peduto L, Bernard D, Kirsh O*, Defossez PA*. Mechanisms of DNA Methyltransferase Recruitment in Mammals. Laisné M, Gupta N, Kirsh O, Pradahan S, Defossez PA. The nuclear receptor RXRA controls cellular senescence by regulating calciumsignaling. Ma X, Warnier M, Raynard C, Ferrand M, Kirsh O, Defossez PA, Martin N, Bernard D.
Aging Cell. 2018 Sep 14:e12831. doi: 10.1111/acel.12831. Ferry L, Fournier A, Tsusaka T, Adelmant G, Shimazu T, Matano S, Kirsh O, Amouroux R, de Dieuleveult M, Fritsch L, Kudithipudi S, Jeltsch A, Okano M, Ait-si-ali S, Leonhardt H, Hajkova P, Marto J, Arita K, Shinkai Y, Defossez PA.
Molecular Cell, 2017, Aug 17;67(4):550-565.e5. doi: 10.1016/j.molcel.2017.07.012. Naciri I, Roussel-Gervais A , Defossez PA, Kirsh O. Loss of the methyl-CpG binding protein ZBTB4 alters the mitotic checkpoint, increases aneuploidy, and promotes tumorigenesis. Roussel-Gervais A , Naciri I, Kirsh O, Kasprzyk L, Velasco G , Grillo G , Dubus P, Defossez PA.
Naciri I, Defossez P.-A,Kirsh O.
Lacroix M*, Rodier G*, Kirsh O*, Houles T, Delpech H, Seyran B, Gayte L, Casas L, Pessemesse L, Heuillet, M, Bellvert F, Portais JC, Berthet C, Bernex F, Brivet M , Boutron A ,Le Cam L and Sardet C.
Goguet-Rubio P*, Seyran B*, Gayte L, Bernex F, Sutter A, Delpech H, Linares LK, Riscal R, Repond C, Rodier G, Kirsh O, Touhami J, Noel J, Vincent C, Pirot N, Pavlovic G, Herault Y, Sitbon M, Pellerin L, Sardet C, Lacroix M, and Le Cam L.
Screening of a kinase library reveals novel pro-senescence kinases and their common NF-κB-dependent transcriptional program. Ferrand M, Kirsh O, Griveau A, Vindrieux D, Martin N, Defossez PA, Bernard D.
Description of an optimized ChIP-seq analysis pipeline dedicated to genome wide identification of E4F1 binding sites in primary and transformed MEFs. Houlès T, Rodier G, Le Cam L, Sardet C, Kirsh O.
Rodier G, Kirsh O*, Baraibar M, Houlès T, Lacroix M, Delpech H, Hatchi E, Arnould S, Severac D, Dubois E, Caramel J, Julien E, Friguet B, Le Cam L, Sardet C.
E4F1 deficiency results in oxidative stress-mediated cell death of leukemic cells. Hatchi E, Rodier G, Lacroix M, Caramel J, Kirsh O, Jacquet C, Schrepfer E, Lagarrigue S, Linares LK, Lledo G, Tondeur S, Dubus P, Sardet C, Le Cam L.
Coupling mitosis to DNA replication: The emerging role of the histone H4-lysine 20 methyltransferase PR-Set7. Brustel J, Tardat M, Kirsh O, Grimaud C, Julien E.
Set7 regulates replication origins in mammalian cells. Tardat M*, Brustel J*, Kirsh O, Lefevbre C, Callanan M, Sardet C, Julien E.
FLI-1 functionally interacts with PIASxα, a member of the PIAS E3-SUMO-ligase family. van den Akker, E., Ano, S., Shih, SH., Pironin, M., Palvimo, JJ., Kirsh, O., Dejean, A., Tran Quang, C., Ghysdael, J.
PIAS1 interacts with the mineralocorticoid receptor via its N-terminal domain and represses its transcriptional activity- implication of SUMO-1 modification. Pascual-le Tallec, L., Kirsh, O., Lecomte, M., Zennaro, MC., Dejean, A., Lombes, M.
The SUMO E3 ligase RanBP2 promotes modification of the HDAC4 deacetylase. Kirsh O., Seeler, JS., Pichler, A., Gast, A., Müller, S., Miska, E., Mathieu, M., Harel-Bellan, A., Kouzarides, T., Melchior, F., Dejean, A.
Bischof, O., Kirsh, O., Pearson, M., Itahana, K., Pelicci, PG., Dejean, A.